Since Indonesia straddles the equator, the climate enjoyed by Borobudur is really quite hot and sunny, being categorised as tropical. The weather in Borobudur generally falls into two main seasons - dry and wet. The dry season in Borobudur arrives in May and the climate features virtually no rain whatsoever until October. Due to the fine, dry and sunny weather at this time of the year, tourists visit Indonesia in their greatest numbers. However, do bear in mind that with relatively high levels of humidity, the dry season highs of 31°C / 88°F can feel even hotter. 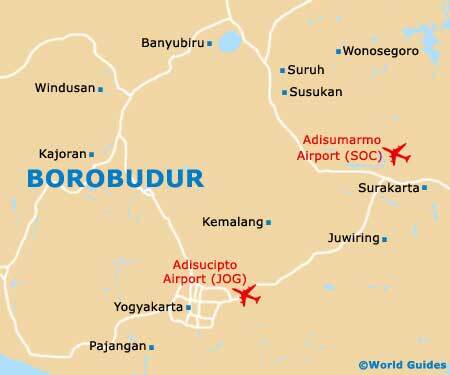 July and August are usually the driest months in Borobudur, while January, February and March are reliably the wettest, seeing precipitation levels topping 600 mm / 24 inches and rising higher on occasion. Heavy downpours and tropical storms do tend to be interspersed with dry, sunny days, and so if you are flexible about where you want to go and what you want to see, a trip to Indonesia during the wet season is quite workable.